Silicon Valley executive Maynard Webb shares some of the practical advice he gives to budding entrepreneurs. Many books offer advice to budding business leaders, but it would be safe to say that none are presented quite like the latest title from longtime Silicon Valley executive Maynard Webb. 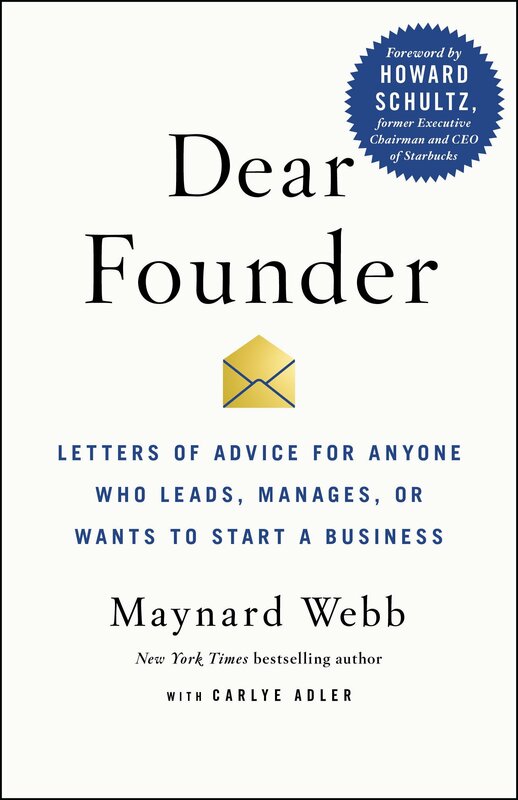 Inspired by a fictional story about a father who left a box of letters to his son, Webb has written a collection of letters titled Dear Founder: Letters of Advice for Anyone Who Leads, Manages, or Wants to Start a Business. Webb has served in senior leadership at eBay and Gateway and spent five years as CEO of call center solutions firm LiveOps. He is currently a member of the board of directors at Visa and Salesforce, and is a former board chairman at Yahoo. In the book, he draws on his own experiences as an investor, entrepreneur and board member to dispense advice for founders on facing common challenges — from missing goals in the first quarter to firing an employee to knowing when to grow the business. Webb recently joined the Knowledge@Wharton radio show on SiriusXM to discuss his new book. Knowledge@Wharton: The way you use letters to present the information in your book is a format that really drives home ideas for the reader. How did that come about? Maynard Webb: I can’t take all the credit for that. My son came up with the idea, and it really resonated. We give advice all day long in the Webb Investment Network [an early stage venture capital firm he started in 2010], and it’s a blast. We’re always trying to figure out how to codify that advice so we can share it more broadly. My son read an article on Medium about a father who was dying and had left his son a number of letters to read at different instances in his life — the first time your mom is mad at you, when you have your first date, when you get married, when you’re going to die. We just thought that was very similar to what we do in life with business. We thought that was just a beautiful way to try to frame what we’re doing. Knowledge@Wharton: Is the advice in the book some of the same lessons you have learned in your own career? Webb: We were blessed that we had several of what I call affiliates — people who invest by my side and help our companies — suggest letters. I’ve been a startup guy, and I’ve been a big operating executive, and I serve on boards, so I’ve seen a whole spectrum of things. Most of the letters are from me, based on what I have seen and tried to give advice and help. The advice may not resonate with an entrepreneur, but I’m just trying to give what I know. I’ve been so lucky and blessed in my career. At this stage, I really want to keep learning and keep giving back and helping people. It’s hard to be successful and create a company from scratch. And when you get lucky and the company does well, it’s hard to scale it. People can use help all along the way. Knowledge@Wharton: The success rate for new businesses is very low. You give some frank advice in the book about getting started and what’s involved, correct? Knowledge@Wharton: You touch on key issues such as culture, inclusion and diversity, which are very important topics not only for Fortune 500 companies, but for startups as well. Webb: On diversity and inclusion — I needed help, to be honest with you. I’m an old white man. So, I got help from several of my affiliates who run HR organizations at Airbnb and eBay. I’m on the Visa board, and the head of HR helped me there. I went to Stanford and got help from The Clayman Institute for Gender Research. Those letters on diversity and inclusion were maybe the hardest letters in the whole book to write. If you tackle it early, it’s so much better than if you wait. And once you get past 50 employees, it’s really hard to do and do it well. Knowledge@Wharton: What are the important things that entrepreneurs should think about when it comes to financing their companies? Webb: My team helped on those letters a lot because they spend a lot of time on that, and it occupies entrepreneurs’ minds. It’s not only how to get the money in the beginning, but when you get the money, you usually have 18 months’ worth of runway, so you’re thinking about your next round and how you are going to do it. You’re either in a moment where everybody loves you too much and is willing to value you higher than you deserve, or nobody’s willing to give you anything. We’re trying to provide encouragement and advice on how to deal with both of those situations. Knowledge@Wharton: How has management style and leadership changed over time? Webb: It is amazingly different. If you think about the paternalistic company that used to exist, we’re leading with inspiration today a lot more. It’s far better. It’s all about helping people achieve their potential, but it’s more complicated, probably, than it used to be. There are certainly more data points of information every day, coming from everywhere. It’s not just within your company. Technology is amazing, but what people do with technology can be good or bad. There are more signals and more noise than ever, so you really need to be able to get rid of the clutter and focus on what matters to grow your business. Because you can stay occupied all day long with noise. Knowledge@Wharton: In the book, you talk about having a board of directors. A lot of entrepreneurs probably don’t have to worry about that right at the start, so why did you include that? Webb: Every year, we do a CEO Summit where we have a couple of hundred people spend two days together, talking about a lot of the things that are in the book. They always ask for a session on the board. Oftentimes, they’re just trying to figure out how to get the money and from the person who’s willing to value them the most. And I’m like, “No.” The money will go quickly, but the person who got a board seat is going to be there for a long time. Let’s make sure we pick that person wisely. They’re probably the only person in the world who gets to fire you, and that’s their biggest job. If an employee doesn’t work out, they can leave or you can have them leave. But if a board member doesn’t work out, they have a legal right to still be there, so it’s much more complicated. Knowledge@Wharton: You cover a variety of topics that are perhaps overlooked by new entrepreneurs, such as when to fire an employee. That’s a situation most business owners don’t want to confront. Webb: I wrote that one because one of my CEOs came to see me and said, “We have somebody who’s really bad, who’s not performing, but he has a dog. And that dog is a culture-carrier in the company.” I was like, “Are you kidding me? Fire the person. Keep the dog!” But not really. It was like, “Well, poor performance has to be addressed, and it will be fine.” But people stress about it, and they don’t know how to do it. We try to give advice on how to do it with grace and dignity but not step away from it. Knowledge@Wharton: You also write about how setting the tone for the kind of culture you want to have in a company is very important. Webb: Every employee, every person, every customer, everybody is watching what you do. You may not think about that when you’re just getting started but they are. Knowledge@Wharton: You talk about the challenges that leaders face. Can you tell us about that? Webb: As I wrote this book, so many of these things happened, and we would be like, “Oh, that’s an insight. [Co-author] Carlye Adler and I should write a letter on that.” Some of the insights came from my board work or my work in bigger companies or from an entrepreneur who was starting to grow. It has been interesting to see companies as they scale and what they start facing. On the board of Salesforce, we’re at 30,000 and we’re going to add 30,000 in the next four years. So, hiring two people seems quaint to them, but it’s problematic to an entrepreneur. We try to just show a path for how to do everything along the way. Knowledge@Wharton: If you serve on a nonprofit board, how do you keep your board well-trained with the best practices, not just looking into the business, but their internal processes and how they’re functioning? Webb: A good practice that most boards do is that they ask directors to get external training on the latest trends. But I also think having director assessments is a good thing and a good practice, because I always wanted, when I was a CEO, to make sure that the person who talked the most in the room actually was giving me the best advice. Unfortunately, on some boards, it’s exactly the opposite. I think having assessments where everybody gets to give input on directors and having a board chair who can handle situations when someone’s not contributing — those are all things that could be very helpful. In almost all of this, it’s just transparency and candor. The CEO has to help on some of this and set the tone. Knowledge@Wharton: What advice do you have for keeping the balance between technology and human capital when you are at the point of doing that first true scale-up? Webb: If you are the person building the product, you should be heavily involved in talking to prospects about what’s so special about it. A lot of people feel like, “Oh, I’m a builder. I’m not the salesperson, and I don’t necessarily want to do that.” But you probably have to do more of that in the beginning, and it is so much better when it comes from you than from somebody who didn’t build the product. I would stay true to what you love to do, but you still have to have people buy the product at some point, so building that go-to-market muscle is really important over time. But you shouldn’t cede that to somebody too quickly. Back when I was building technology, I would always try to architect for scale but deploy for what I had today. In the book, I talk about phases. It’s really easy to have ideas, but does anybody really want it? Does it get relevant? I would not be doing a bunch on hiring sales people until you know you have relevance, meaning that the world wants what you have. Then when it’s time to scale, and you know they want it, that’s when you need to bring the army. Knowledge@Wharton: What are the components of companies that are built to last? Webb: I think it’s really amazing and lucky, and you’re blessed if you get a company to scale and get it public. Then the issue is, how long do we want to exist? If you have a chance to have a company last across generations, that’s incredibly rare and special. How do you keep it young so that it doesn’t feel old? I don’t think you can think about it too soon because you have to build a company that people want to buy something from. And all along the way, you have to keep updating how you treat people, how you treat customers and what you believe in, so your values endure all the way through. What entrepreneurs need is flexibility and innovation -- not a traditional business plan -- says economist and author Carl Schramm.